There's something inherently reassuring about making lists. And if ever the list becomes full (which it is unlikely to be when you're searching [sometimes randomly] for thousands of different species), a new one can be constructed. In reality, the course never runs smooth. The last time we followed this section of the River Exe gently upstream, we had to turn back prematurely. I always like to plan a walk with a destination in mind so going halfway invariably breeds a mood of underachievement, a mood soon banished by plotting a sequel. Nine months or so later, that sequel was ready to be enacted. Predictably, it didn't entirely go according to plan. Challenging driving conditions, in the form of heavy rain and hail, forced a later start. As soon as we arrived, we decided refreshments were in order. The act of sitting down is easily accomplished. The act of getting up again proves a bit more difficult, even allowing for the caffeine fix. Eventually we made a move, joining the footpath adjacent to Bickleigh Mill and entering a wood. After the sustained deluge of recent weeks, I wondered if I had been a bit foolish in our choice of destination. Would we able to reach Tiverton this time without turning back? There were certainly enough things for Sherry to photograph though the light was dim out of the trees and deteriorated further once we were under the woodland canopy. 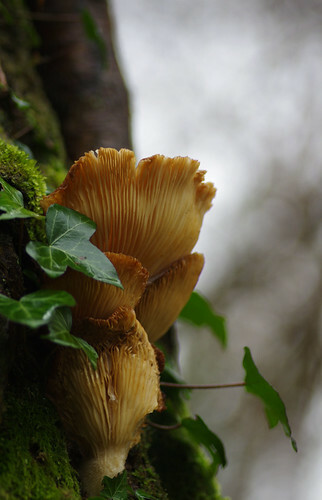 After a few failed attempts at capturing some fungi by the side of the path that might have been either Crystal Brain or the closely related White Brain (more of which later) we entered the wood. Mud was everywhere and we had to keep an eye on where we were treading as much as the general suroundings. 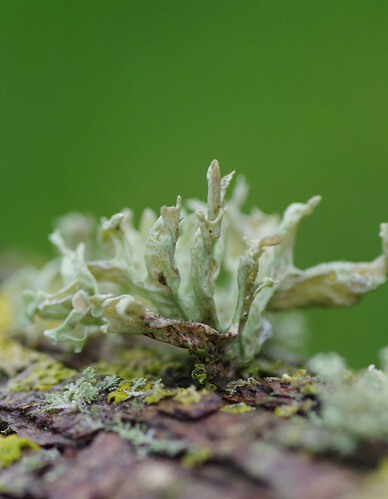 I think we have probably seen this species before on deciduous branches but have been previously unable to confirm its identity. 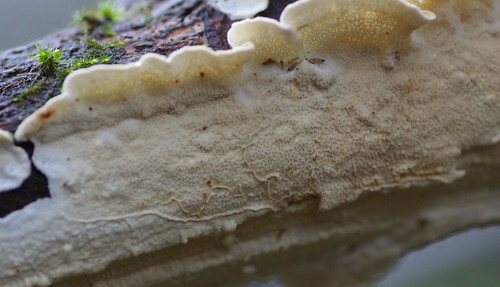 Its curved edges often just clear the edges of branches and twigs. A group of larvae were taking shelter under the upper lip. This is the wettest, softest form of this species. Its surface has a pattern of recurring miniature depressions. 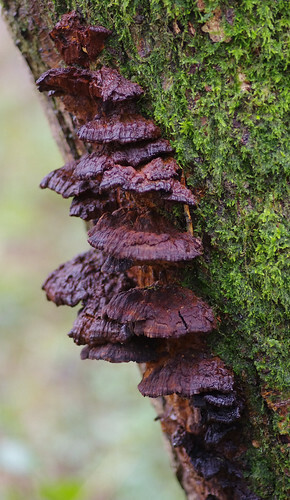 Where fungi were not present, branches were bedecked in mosses. Everything was saturated and therefore a different shape. 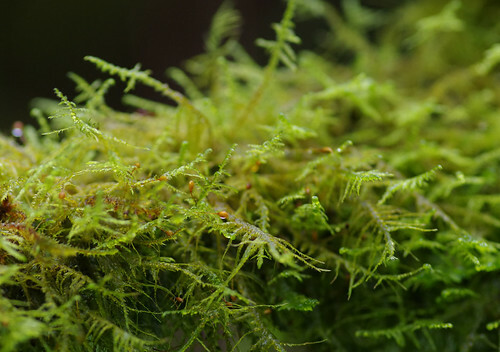 This is most probably a type of Feather-moss. Sherry approached the problem from a variety of angles. The image below shows a closer view with capsules. 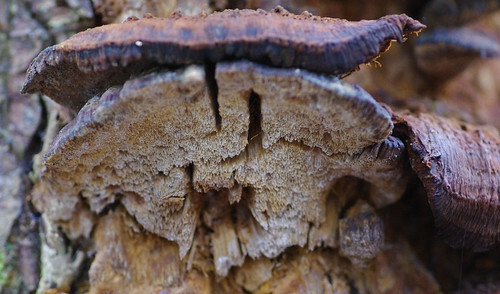 We've frequently seen fungi by tree roots and at the base of trunks. But this was above head height, snug within the tree. 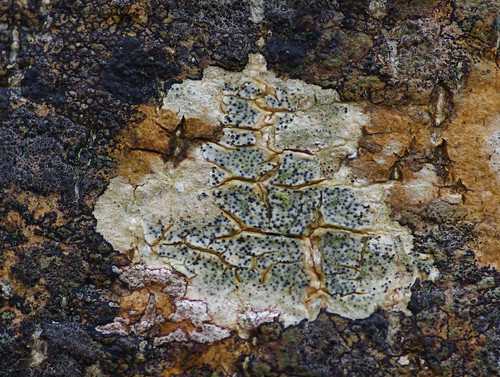 This crust fungus had an unusual colour and provided an easy match when checked against the field guide. The path fluctuated in height above the raging river then descended to run parallel alongside it. The Exe looked as if it might burst its banks at any moment. During our last visit (also after local flooding) we saw the bloated corpse of a cow washed up on an island of rocks. The same area was now completely submerged. As the terrain became flatter I thought the way ahead would be flooded and we would have to double back. On the subject of trees, this trunk held us totally enthralled. 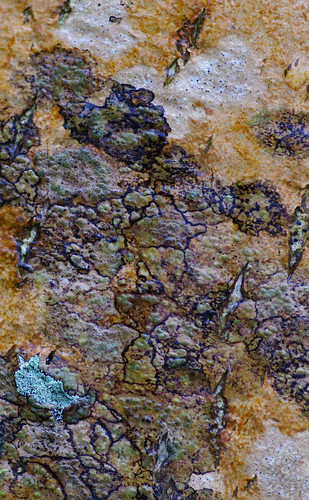 The surface appeared to have the consistency of dried wax that had developed cracks. When magnified it is possible to see tiny white dots scattered over the surface. 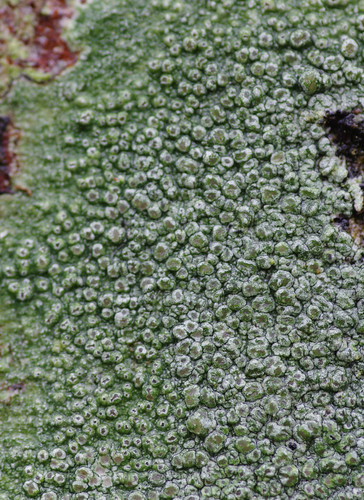 The black fruits project from the surface when they are mature but here they are mostly immersed in the thallus. At this point you might be forgiven for thinking you were looking at the exquisite work of a jeweller, creatively blending many precious metals and minerals. It was glossy and glazed in one light then appearing slightly slimy in another. 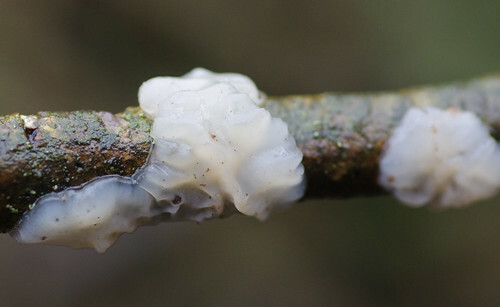 Each slimy-shiny section had numerous miniature fruits immersed within the body. One giant tree had succumbed to the storm and our path became a multi-layered obstacle course. 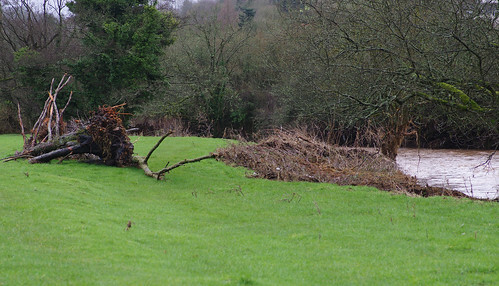 In another place, fallen branches had been banked up to stop the raging river further encroaching on the land. 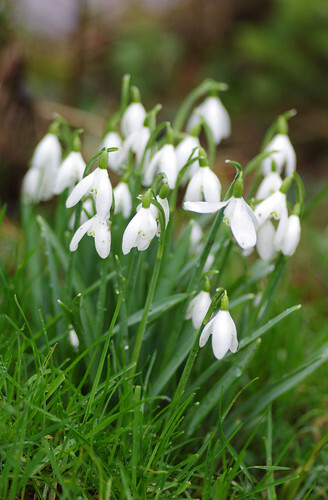 It is always a pleasure to see snowdrops. Traditionally, they herald the thaw and are one of the first signs that spring is on the horizon. With the current topsy-turvy climate many flowers barely have a chance to shine. 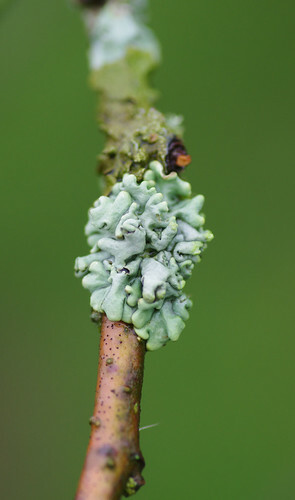 This species features in the Field Studies Council 'Lichens on twigs' booklet. We examined a number of twigs and branches, looking out for new species, and also familiar ones in different situations. 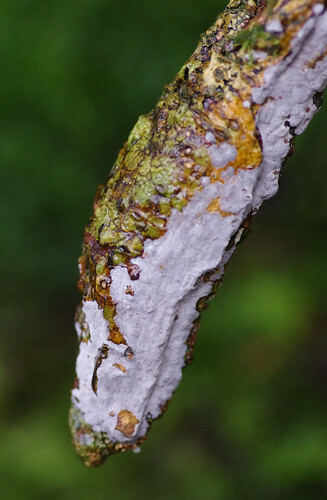 The part of the lichen attached to the ground (or a branch, in this case) is known as the holdfast. 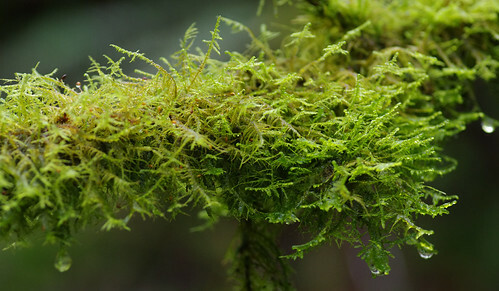 This is the holdfast of Oakmoss (Evernia prunastri). This shows the devastation the river has caused. The last time we walked along right to the edge - an edge that was now underwater! 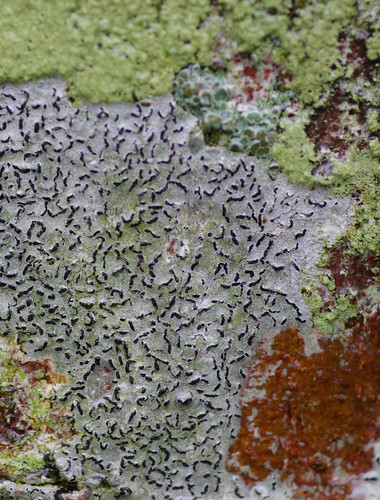 This resembles the wet, green form of Pertusaria pertusa - except that the apothecia have no rounded, bobbly bits or holes in the top. These remind of marbles: cut and then repeatedly abraded until the glassy surface becomes rough. 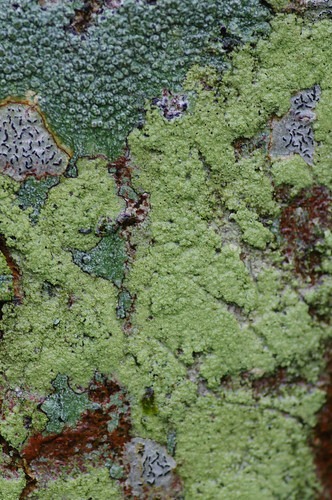 On closer inspection, after more species searches, this turned out to be an example of another Pertusaria species, Pertusaria hymenea. This fungi species tricked my eyes into thinking it had been expertly carved. Underneath and from a distance I could have sworn it was wooden. And here it is from a distance. Our brains were being tested to the limits at almost every tree we came to. But it was equally important to keep pressing on towards Tiverton. At this rate of progress, we would have needed tents and several days to reach our destination. So, with urgency at the forefront of our minds, we forged onward, pledging to be more selective in our sightings.